Every party needs fun games. Summer seems to have a lot of birthday parties. I wonder if it is because of the cold winters? I have brainstormed some of my favorite games from childhood. Here is a list my favorites. Enjoy, and if you have any fun ideas click here to leave a comment and tell us your favorites. Directions: Let kids take turns snapping pictures of each other making crazy faces. The object of this game is to see who can make the craziest face. Kids can take a vote and give a prize to the craziest face. Directions: Group kids into pairs. Place one egg on a spoon, and then have a child to place the end of the spoon between their teeth. One child walks halfway to the finish line, and then passes the egg (from one spoon to the other) to their partner’s spoon. The partner then attempts to reach the finish line without breaking the egg. The object of this game is for partners to successfully pass the egg from one spoon to another and reach the finish line without splattering the egg everywhere. Side note: This game is best played outdoors because of the mess factor. Directions: Sit kids in a circle. Make a pile of the story-telling items in the center of the circle. The first child starts the silly story by selecting a piece of clothing or an accessory from the pile. She puts it on, then makes up a silly story line. Example: A child might say something like, “Suzie needed a gallon of milk, but her hair was too short so she put a hat on her head.” While saying this, the child places a hat on her head. The next child follows in suit, choosing something from the clothing pile and putting it on while adding to the story. The story continues in the circle until every dress-up item is used and the story has ended. The object of this game is to have fun making up a silly story and dressing up. Directions: Blow up balloons before party time. Spread shaving cream all over a balloon. Let kids take turns “shaving” a balloon. The object of this game is to shave your balloon completely without popping it. Side note: This game should be played outdoors because of the mess factor. If playing indoors, spread newspaper on the floor before you begin. Pair off children and tie their right and left legs together. Race from one end of the yard to the other. The team that makes it to the end of the yard first wins the race. Take turns racing, while jumping rope, from a beginning to ending marker. The child that reaches the end first without falling wins. Many department stores carry fun sprinklers that you can attach to your garden hose. These are always a huge hit for outdoor kid parties. Just screw the sprinkler into the end of the hose, set it in the middle of your yard, and let the kids have fun running through the water. Just about every kid loves badminton. Set up a net and separate kids into teams for a fun game of badminton. Play quick matches of 15 points, then mix up the teams and start all over again. Cut big slices of watermelon and pass out to all the kids. See who can spit their watermelon seeds the farthest. 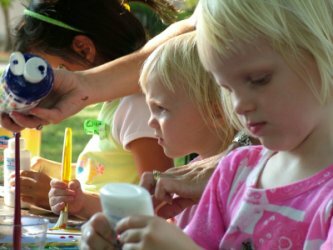 CRAFTS AND PICTURE PAINTINGFor something different, try crafts or picture painting and hold a contest for the best picture or craft. This is another fun outdoor game for kids. After running through the yard sprinkler, have water balloons ready to go. Group kids together in pairs. Let them take turns tossing the balloons to each other from a distance. The pair that ends up with the remaining water balloon in tact wins. Does Your Child Have a Million Toys and Still is Bored?